Learn R programming for data analysis in a single day. 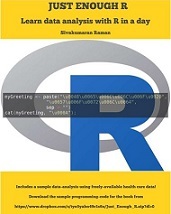 The book aims to teach data analysis using R within a single day to anyone who already knows some programming in any other language. The book has sample code which can be downloaded as a zip file. With more than two million global users, the R language is rapidly turning into a top programming language specifically in the space of data science as well as statistics. What you are going to learn in this step-by-step beginner’s guide is how to master the fundamentals of such a gorgeous open-source programming language which includes vectors, data frames and lists. This book has been crafted in a step-by-step manner which we feel is the best way for you to learn a new subject, one step at a time. It also includes various images to give you assurance you are going in the right direction, as well as having exercises where you can proudly practice your newly attained skills.